Women of the Black Sash march to the Union Buildings in Pretoria to deliver petitions signed by over 100 000 women for the repeal of the Senate Bill to the Prime Minister's deputy, Mr Ben Schoeman, Minister of Transport. 1955. In honour of 60 Years of the Black Sash, UCT Libraries is showcasing the Black Sash archives in Special Collections and the related holdings in UCT Libraries. The exhibition can currently be viewed in the entrance to the Chancellor Oppenheimer Library on Upper Campus. The Black Sash is a non-violent white women's resistance organisation founded in South Africa in 1955 . The Black Sash initially campaigned against the removal of Coloured or mixed race voters from the voters' roll in the Cape Province by the National Party government. As the apartheid system began to reach into every aspect of South African life, Black Sash members demonstrated against the Pass Laws and the introduction of other apartheid legislation. Members of Black Sash protest at the side of the road. "used the relative safety of their privileged racial classification to speak out against the erosion of human rights in the country. Their striking black sashes were worn as a mark of mourning and to protest against the succession of unjust laws. But they were not only on the streets. Volunteers spent many hours in the national network of advice offices and in the monitoring of courts and pass offices." (Speech by Marcella Naidoo, National Director of the Black Sash, June 2005). UCT Libraries Special Collections is home to a wide variety of collections that document the work of the Black Sash. Athlone Advice Office. Annual report for year October 1st 1973 to September 30th 1974​. Documenting the vital work done by the advice office, inter alia issues pertaining to domestic workers, contract workers, applicants for residential rights, and squatters regarding pass laws and other influx control measures under apartheid. This collection consists of records of the Black Sash Trust, which was formed when the Black Sash evolved from a membership organisation to a non-governmental organisation. A portion of the Black Sash collections is available via our digital collections website. 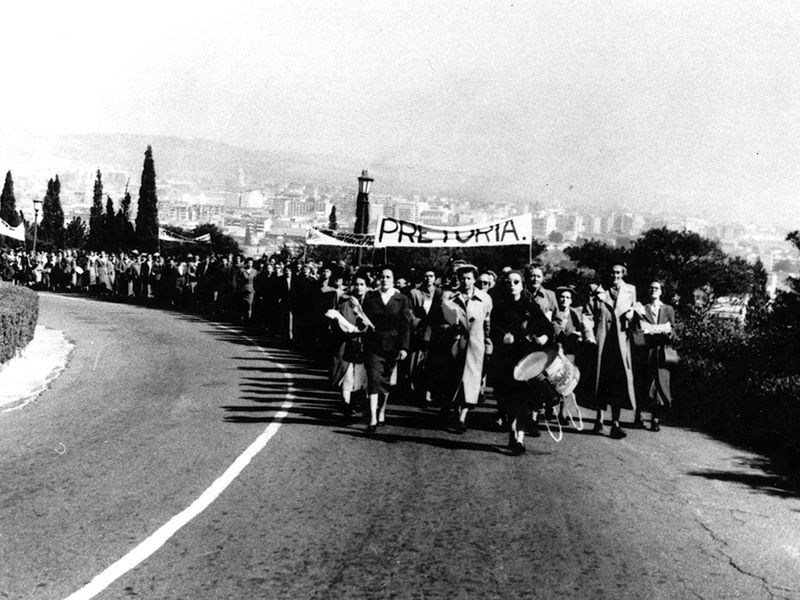 Di Andrews and other Black Sash members demonstrating next to a busy road. The placards read: "Black River (Fraserdale). White Group Area. Illegal". A member of Special Branch stands in front of them taking their photograph.